A convenient gap in the trees! I often get asked if trees can effect satellite reception, well the answer is yes, if they are in the line of sight of the dish they certainly can. The Spring and Summer being the worse times for this with them being in leaf. The satellite signal is already very weak when it reaches earth, it has come a long way after all…around 22,000 miles, and anything in the way of this weak signal will have an effect. The effect from trees can be worse in wet weather because the water on the leaves will further attenuate the signal. 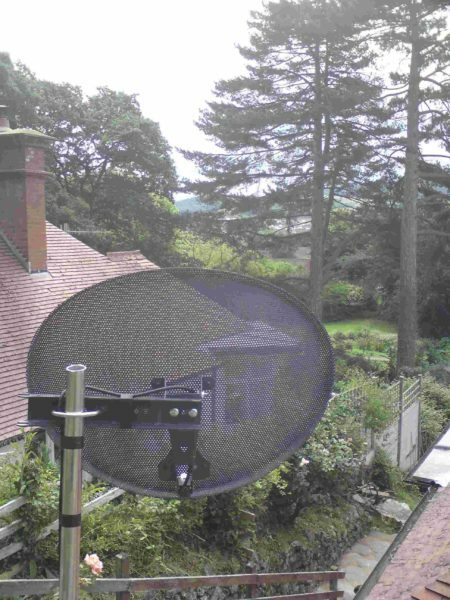 If you have had a dish for some time and suddenly find the signal breaking up, especially in windy weather, it may be worth just popping outside and seeing if there are any trees, bushes or shrubs in the line of sight of the dish. I had a call at a caravan park where the satellite signal had started to break up and then disappeared in the space of a few days. Looking outside I noticed the dish was almost at ground level and there was an old tree stump about ten feet from the dish, this stump had started to spout twigs and leaves and this was enough to block the signal. A bit of pruning was enough to restore their reception. I got the usual response of “but it was OK until ten days ago”, well it would have been because there were no leaves on the twigs then. Often a tree in the garden that has never been a problem can suddenly become one because they have an annoying tendency to grow. The dish can only work as long as it is receiving enough signal, over time a tree can very gradually obscure the signal, the receiver will continue to work with the signal it has until it reaches a point where it just isn’t getting enough and has to call it a day! This happened at a property at Flaxpool, about 150 yards from the house was a line of very tall Sycamores, they had grown just tall enough to obscure the signal to my customers dish. It was already about as high as it could go and I got the impression it had gradually worked it’s way up the wall over the past few years, all I could do was put it on a pole, this gave it an extra four feet of height, enough to keep it above the treeline for a couple of years at least. My next visit to this customer may require a chainsaw! Well I have an update on the above case, yes it is a couple of years later and yes, the trees have grown enough to start becoming a problem again. My customer has applied to have one of the trees removed, but in the meantime I have had to replace the six foot pole with an eight foot one. I’m not happy with that as the dish is going to move around like a pendulum in the wind, unfortunately at the moment there is nothing else we can do. I have put it into the customers mind that it could be possible to mount the dish on a pole at the tree line and either bury an armoured cable or take it the aerial route via a guy wire to the house, thus saving the trees life and probably saving him money at the same time. At least I’ve bought him a little time to weigh up his options. There was another instance where the dish was on a fence post in the garden, there was a large shrub actually growing into the dish and yet they had only just lost reception…to this day I have no idea how that dish had been working!